"About six out of seven (86%) US companies surveyed have used social technologies in support of one or more areas of their business, found a recent study conducted by Mzinga in collaboration with Babson Executive Education. 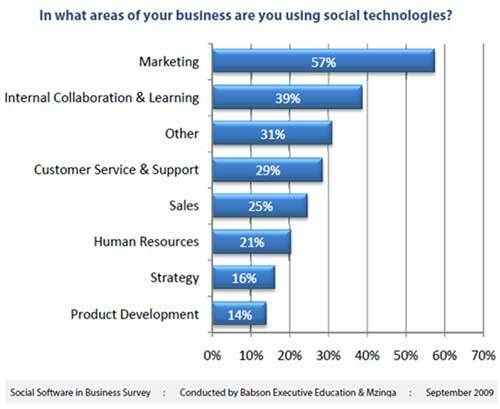 More than 60% reported using some form of social technology as an ongoing component of their business. Some 55% of respondents say their business devotes employee resources (part-time or full-time) to manage and drive social media initiatives, yet only 40% have allocated budget to those efforts. Common challenges organizations face include senior leadership's acceptance, definition of program strategies and goals, resource constraints, and lack of measurement and ROI tracking. 41% of respondents do not know whether their current social tools can measure ROI. 55% of respondents report that their current solutions do not lack features or functions they wish were available. Of the respondents reporting that their companies use social media, 39% use vendor-provided solutions, 26% have implemented proprietary solutions, and 20% use free or trial downloads. About the data: The survey was conducted August 3-12, 2009, and drew more than 555 participants from various professional disciplines, including media, financial services, consulting, marketing, human resources, and engineering. The report is available as a download."